The styling component is just further encouragement. Fishtail braids, porcelain skin and red lips to follow... its Mother Nature meets Earth Goddess afterglow. Subtle geometrics in the accessory department parallel the pattern work, and this is all just a nice flow. 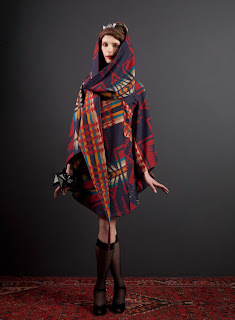 Again and always... Lindsey Thornburg: stylish escapism, one cloak at a time. those are really cool! i want one!